When a restaurant gets new chairs, it's newsworthy! It's not very often I get a press release about a restaurant's chairs. But Vancouver's NU Restaurant & Lounge has finally done something about its uncomfortable seating. 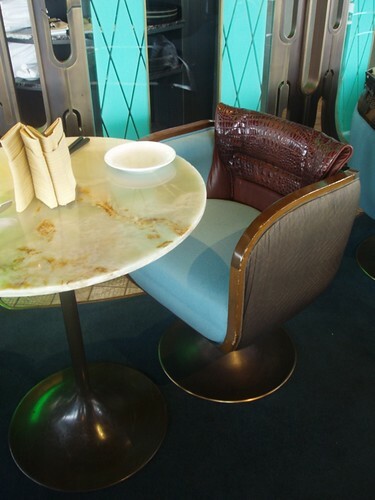 Owner Harry Kambolis acknowledged the chairs were controversial since the restaurant opened in 2005. Although the resto received rave reviews in the kitchen, including enRoute magazine's Best New Table for 2006, the chairs were somewhat of an issue. The problem has been solved by taking the original design of the chairs and adding a higher creature comfort factor to each and every one. I'm going to Vancouver next month so will do my, "This chair is too soft, this chair is too hard, this chair is just right!" routine. NU Restaurant + Lounge is located above the water with views of False Creek, Granville Island and English Bay. The menu features farm to table casual cuisine. 1661 Granville Street. 604.646.4668.